Fitinky 45° vnější konický závit Ø 17 mm x vnitřní Ø závitu 14.5 mm pár. Fitings 3/8" to 3/8" 45 degree pair. Four sizes available for directly installing oil cooler and filter adapter in either 1/2 or 3/8 inch hose sizes. When it is necessary to mount cooler parts in tight or limited clearance areas, our 90° and 45° fittings will be of great help. These fittings are used with the barbed fittings listed below. 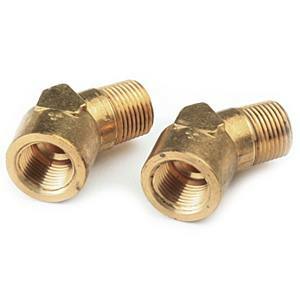 All fittings are the highest quality brass for easy installation and leakproof operation.